C'est l'heure verte. 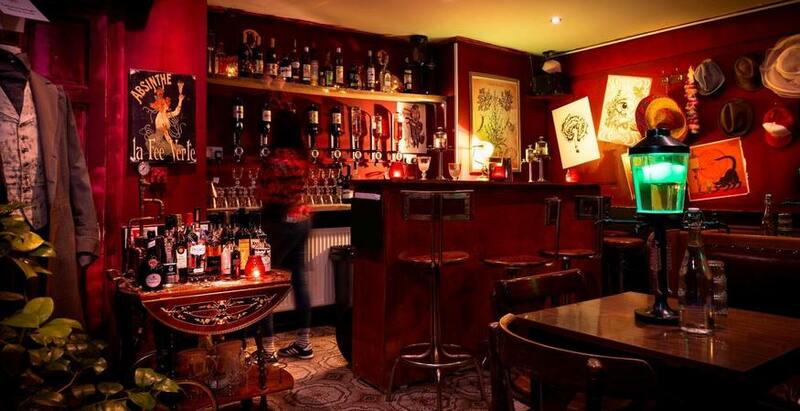 But you needn't travel to Belle Epoque Paris to indulge in the green fairy: this absinthe bar is in Mornington Crescent. London's overseen the renaissance of pretty much every liquor under the sun — from Campari to mezcal — and now it's the turn of absinthe. This liquid legend of perniciousness is spiked with romance, scandal, outlaw — and inculpated for rotting as many great minds, as it inspired. Croque Monsieur (which confusingly serves pizzas, and not croque monsieurs) is the green fairy's unlikely proponent. 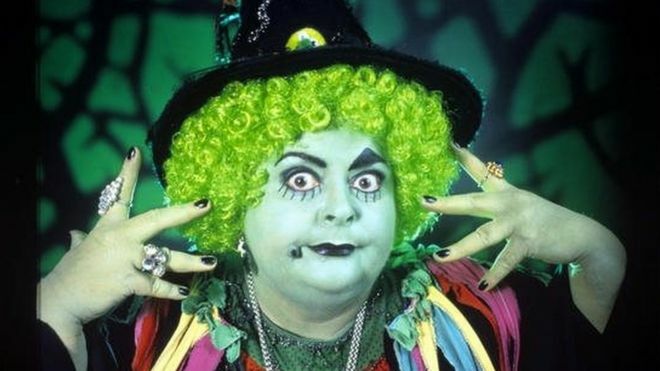 Just follow the Grotbags-green glow, down the stairs beneath Lost Boys pizza joint by Mornington Crescent station. With its gallery of strung-up hats, and absinthe fountains radiating like the carbon rod at the start of The Simpsons, the bar has a studenty, lived-in feel. It's what you want from a joint that's all about throwing caution to the wind, and blustering "How strong can 72% ABV really be?" Every cocktail comes laced with absinthe, the menu helpfully divvying them up into 'Beginner', 'Intermediate' and 'Advanced'. Our sazerac is overly sweet and iceless — not the best we've had — while the Death in the Afternoon is overwhelmed by absinthe, which also renders the champagne flat. We can blame Ernest Hemingway for that: it's his drink (and his suggestion that you "Drink three to five of these slowly." We didn't.). The Parisienne Spritz fares far better, indicating, to our chagrin, that we're probably in the 'Beginners' camp. The trick for first timers, we reckon, is to plump for a pure Fee Verte, magicked milky-green by cold drips of water from the fountain. No sugar cubes like you get in Barcelona's Bar Marcella, we're told. Sugar was all about the status symbol, and good absinthes shouldn't need it. We'll not pretend that all the nuances of absinthe are suddenly unlocked in one aniseed-doused mouthful. But these slow sips of Espirit Edourde ('reverse-engineered' from a long-lost Cuban recipe) are deliciously invigorating to the point we think we may be able to go home and pen something as good as For Whom the Bell Tolls. 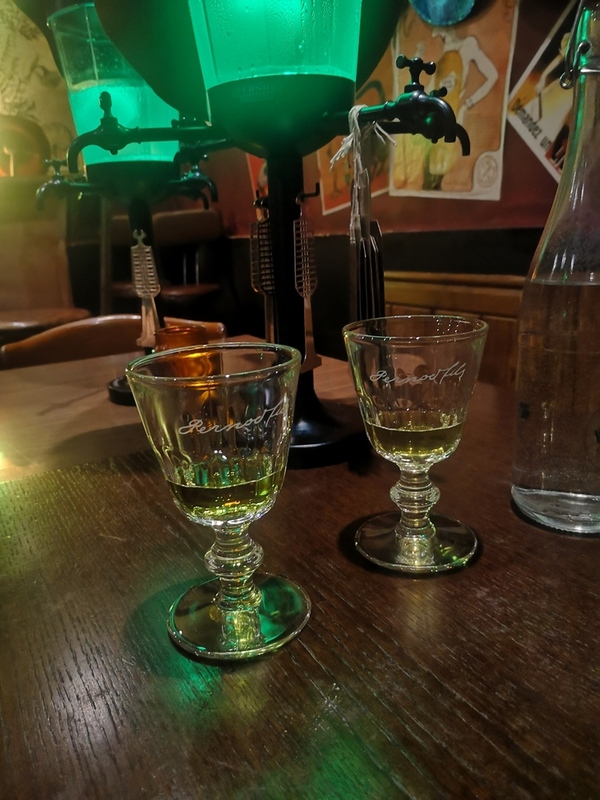 You might leave Croque Monsieur feeling like an alcoholic Bertie Bassett, but this place pours shame on the notion of absinthe as some hellish green tincture you knock down on a stag do. Croque Monsieur, 245 Eversholt Street, Mornington Crescent.